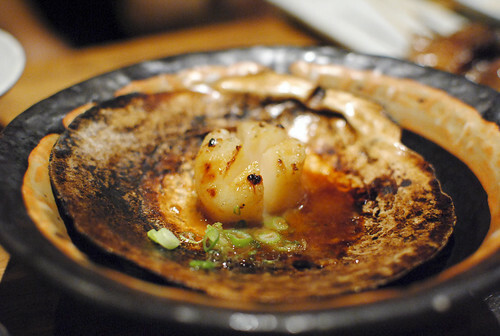 One of my (and my family’s) favorites in Las Vegas is Raku. It’s an off-strip spot located in a Chinatown plaza which was probably a hidden gem for some time. 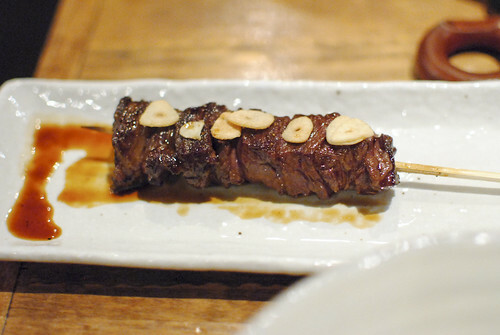 Not anymore though; it’s become very well-known for its homey, comforting Japanese food and robata grill, even making an appearance along with high-end Strip restaurants at the recent Vegas Uncork’d Grand Tasting. 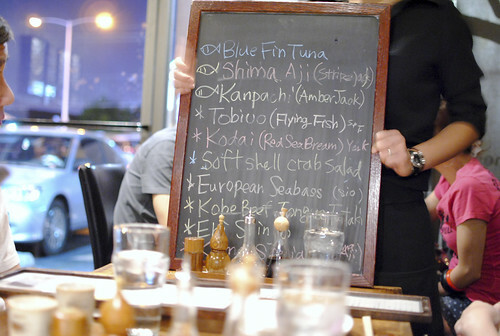 Chef Mitsuo Endo was even a semifinalist for a James Beard award both in 2011 and 2012. I had a delayed flight that arrived just after 11pm in Las Vegas, but a meal was still in order. 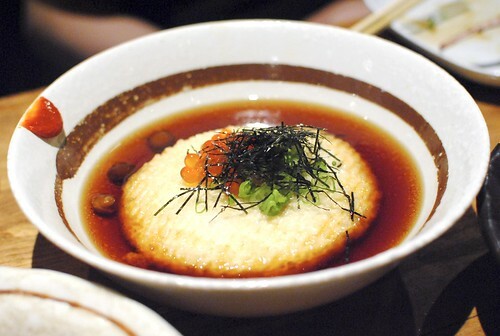 Being open very late (3am), Raku was perfect for a late-night meal. Although my parents came just a few days earlier, they were still eager to visit again. It would be the first visit for my cousins, aunt and grandmother whom arrived earlier that afternoon. 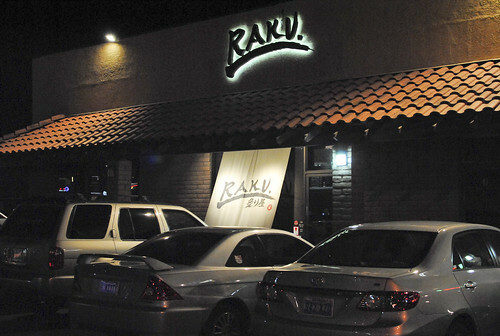 Although located off-Strip in Chinatown, I wouldn’t really call Raku cheap. However, I think you really get what you pay for (quality), and there’s definitely more value here something on the Strip. 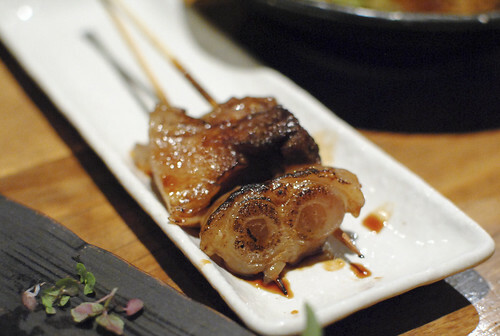 The menu is pretty varied, split up into salads, cold plates, hot plates, oden, rice/noodles, and robata. Daily specials are written up on a chalkboard as well (highly recommended!). We ordered a bunch of items between the 7 of us; some I tried, some repeats that I didn’t (I wasn’t that hungry). Beautiful presentation. 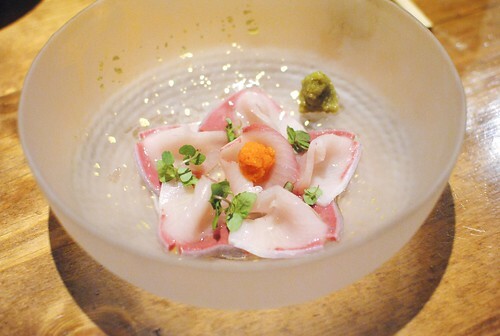 The fish was excellent and even better with the yuzu kosho condiment. This was a favorite during my last trip and still is. My parents said their bluefin earlier in the week was a deep red; this time we lucked out and got some pieces of toro/chutoro (the fatty gradient can be seen on the left). 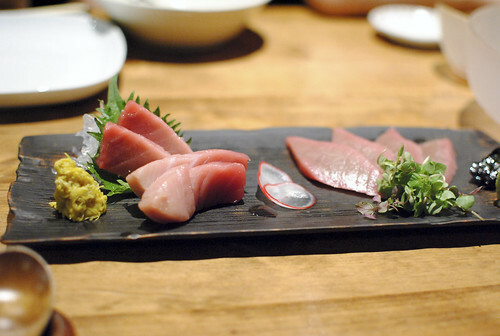 Tender, rich and fatty, these were great pieces of sashimi. A little bit of microgreens helped to lighten up the bites. Seeing this on the daily specials, I had to order it. Slightly chewy with good flavor, these were good bites as well. 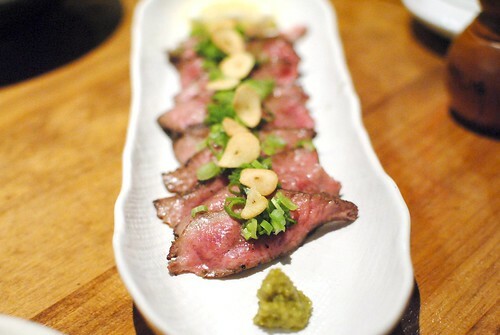 Yuzu kosho and togarashi spice provided some extra depth of flavor (and heat!). This has been a favorite as well in the past. My cousin ordered this one and loved it, though it gets very rich after a lot of bites. Ideal for sharing. 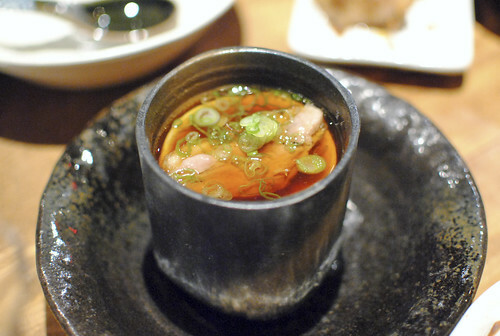 I went for a similar dish where the custard was the centerpiece of a rich dashi soup. 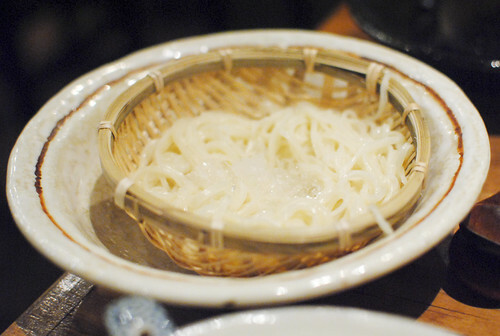 Thin udon noodles (iced down to keep their integrity) were dipped into the soup to make some pretty tasty mouthfuls. The buttery, foie-flavored custard at the bottom was just as good as I remembered. Nutty and crispy, though not one of my favorites. Maybe it’s too healthy. This was better than I remembered – exceedingly juicy and flavorful (fatty), these were good eats. These are eaten whole. 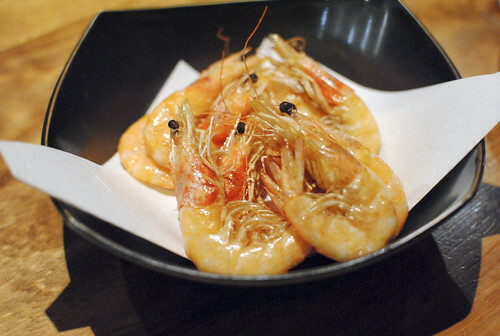 I haven’t really gotten into the whole ‘eating the shell’ thing, but the body of the shrimp was quite juicy and flavorful. A favorite here and one that my mother always has to have, the house-made tofu is silky soft with a delicately crispy shell. There’s a rich soy flavor to the tofu that just isn’t in the storebought stuff. 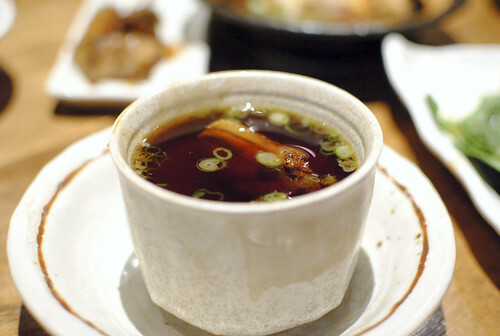 An umami-filled broth provided much of the savory depth of flavor. Delicious. 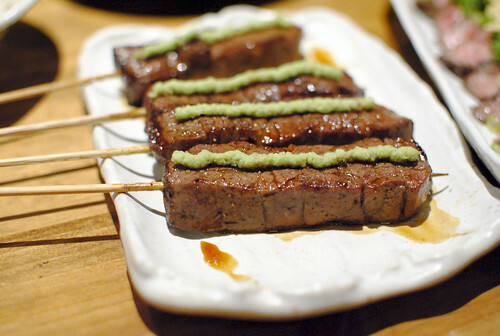 Raku also offers an array of robata items grilled over charcoal. 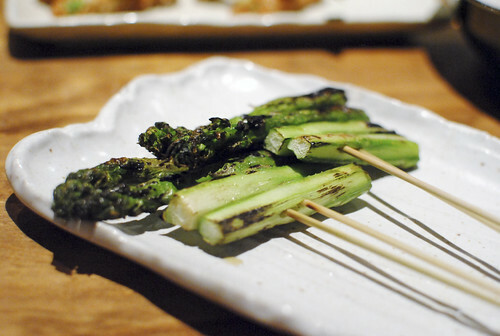 I haven’t had a whole lot to compare to in LA, but Raku seems to really do it right with the combination of the charred exterior and imbued smoky flavor. 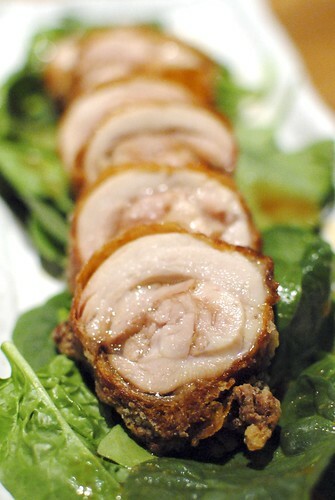 Very tender and juicy (especially for tenderloin) with just a little bit of wasabi complement. This might be my favorite; it’s much more flavorful than the filet. However, it was a bit chewier than I remembered on this visit. My aunt ordered this gelatinous skewer. 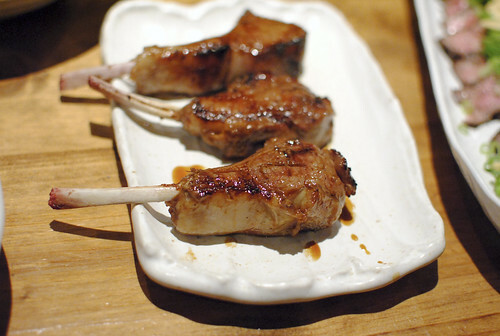 My cousins swooned over the juicy, sweet lamb chops. I feel like I’ve been here a bunch of times but this was only my second visit. It won’t be my last. 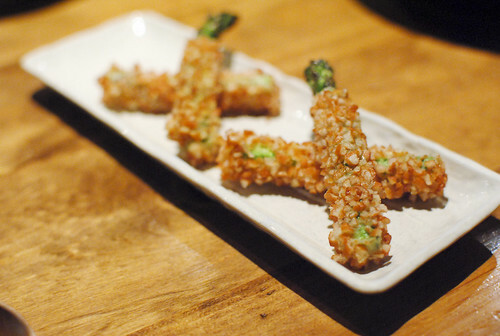 Raku offers a pretty wide array of Japanese dishes that have been well-executed and darn delicious. I need to try the kaiseki menu at some point, but it’s just so hard to deviate from some of my favorites, particularly since this isn’t a restaurant I can visit frequently.